By leveraging VoIP Engine, developers can focus on functionality of the end application without dealing with complexities of voice processing at the native layer. We help you design the application you want. VoIP Engine is portable for use in conjunction with any application or operating system. VoIP Engine (VE) is at the core of our Linux, and ARM-based VoIP applications, it provides complete PCM to packet processing. 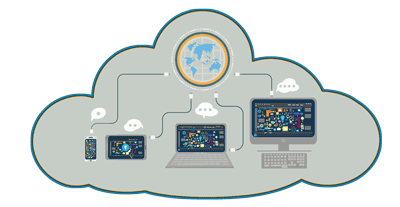 The VoIP Engine software is a software engine package that handles all the voice processing from PCM to Packet and back. Its intended use is in VoIP enabled handsets or desktop phones. The VoIP engine is purely a data processing engine. It has no interface to drivers or peripherals and performs processing solely at the request of the host application. The host application feeds the VoIP engine PCM samples from the audio input and and RTP packets from the network input. The VoIP engine in turn returns, via callbacks to the host application, PCM samples to be sent to the audio output device and RTP packets to be sent to the network interface. Adaptive Digital’s VoIP Engine/SIP Reference Kits accelerate the development of SIP compliant voice applications. VoIP Engine Software development kits (SDKs) are supplied with a sample Java application and a sample native application that in turn interfaces with the VoIP Engine software. The sample Java application interfaces with the sample native application via Java Native Interface (JNI) to setup an RTP/IP to RTP/IP VoIP connection. Android developers can incorporate the Java sample code into more complete VoIP-enabled Android applications. The VoIP Engine API is clean and simple to use. Add VoIP features to an existing application project or create a fully customized SIP application. VoIP Engine Class Library – Provides complete Voice over IP (VoIP) functionality including audio input and output, voice processing, RTP packetization, and network input and output. Sample SIP-Phone Program. This program is a fully functioning SIP phone. It is delivered in source code format, complete with all the necessary project files to build, run, test, and modify the program. The app can be configured to connect to a standard SIP server. The app can place outgoing phone calls as well as receive inbound phone calls. Furthermore, it supports peer to peer VoIP for applications that do not require SIP. SIP Class Library – Provides SIP user agent functionality including network input and output. VoIP Engine for Android works on all devices running Android 2.1 and later. VoIP Engine for LnxVoice works on all devices running Linux. iVoIPEngine runs on legacy iOS4/iOS5 Contact sales for current iOS info. What is VoIP Engine/SIP Reference Kit (RK)? The VoIP Engine/SIP Reference Kit is a SIP Phone application (complete with audio algorithms, SIP, User Interface, control code, and sample application). What features are included in VoIP Engine/SIP Reference Kit? 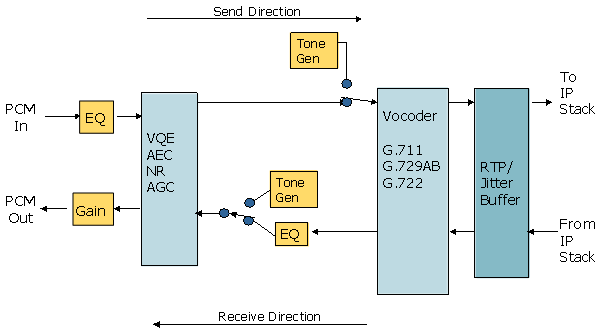 VQE algorithms (AnVoice specific to inherent android issues), HD Acoustic Echo Cancellation, Noise Reduction, , G.711, G.729AB, G.722, AMR WB, RTP, SRTP, SIP plus the sample application, which is provided in source code format along with project/make files. Why should I use VoIP Engine/SIP RK? Because you want to develop your new VoIP_enabled application quickly using robust, field-tested VoIP software. The work has been done for you. Save time and development costs. Flexibility, Wideband algorithms AEC, G.722.1 (Skype is the only other application using WB in cellular network), create new use of vonage, add VoIP capability to new and existing applications. How do I download the reference kits? You will need to contact sales in order to download the reference kit software. Detailed Users’ Guide, and sample code – API functionality explained. What is the Enhanced AEC algorithm? Superior AEC right out of the box. Longer and non-deterministic audio buffering delays. Excessive speaker to microphone gain due to proximity of speaker and microphone. User controlled volume changes that take effect in the audio path between the AEC and the speaker. What other components are included in the VoIP Engine/SIP RK package? VoIP Engine SDK – The VoIPEngine class encapsulates Adaptive Digital’s VoIP Engine software along with platform specific audio and network I/O to provide all voice processing functionality needed for a VoIP enabled application. SIP SDK – The SIP class encapsulates Adaptive Digital’s SIP stack software along with platform specific network I/O to provide SIP functionality needed for a VoIP enabled application. Are VoIP Engine/SIP RK components subject to change? The VoIP Engine/SIP Reference Kit is subject to change as new features are added. Do I need programming experience to use VoIP Engine/SIP RK? Yes, you will need to be familiar with application programming. 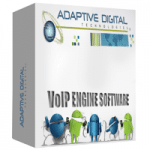 Is the VoIP Engine/SIP RK project owned by Adaptive Digital Technologies? Yes, the project is own by Adaptive Digital. At the time of production/distribution, a license needs to be obtained. What codecs are supported in VoIP Engine/SIP RK? Please explain how VoIP Engine/SIP RK is free of charge? The reference kits are free for developmental purpose only. Product must be licensed for production/distribution. What does the Reference Kit let me do? Develop VoIP applications such as IP Intercom, social networking, add VoIP to multi-user gaming, etc. Are there limitations to the free version of the reference kit? Yes, the evaluation software allows for up to a 5 min phone call. The free version expires (90 days). My Reference Kit evaluation time period has expired, can I extend the usage? Download new, or contact us is same version is required for development. How can I customize the VoIP Engine/SIP RK Platform? See included User’s Guide for features and usability. Sample application source code is provided. For customization by Adaptive Digital’s team of experts, contact sales. How do I obtain a production license? Contact sales +1 610-825-0182 x120 to discuss your requirements. Do I need to license all components, or just components necessary to my application? Contact sales to discuss licensing per your requirements. Can I obtain individual components outside the construct of the VoIP Engine framework? Yes, see website for software availability, or contact sales +1 610-825-0182 x120 to discuss your requirements. The AnVoice – Android VoIP/SIP Reference Kit is a sample Android SIP Phone application named AnVoice that utilizes Adaptive Digital Technologies’ VoIPEngine and Sip class libraries. The application is provided as source code in an Eclipse project. The VoIPEngine and Sip class libraries are provided as jar files.Adaptive Digital’s SIP SDK provides a customizable solution to quickly add SIP based dial and receive phone calls features into software applications. It supports: registration, call initiation, call-acceptance, and call-teardown for VoIP telephones. The kit is designed to get you running quickly. Through the use of a few basic APIs you can configure the system to your liking and easily make and receive calls. LnxVoice SDK is a complete VoIP stack solution that handles all voice processing from the system’s audio interface to the packet interface, and back. LnxVoice SDK features acoustic echo cancellation, noise reduction, and automatic gain control for voice quality enhancement , as well as speech compression (G.711, G.729AB, and G.722 and other optional codecs), RTP and Jitter Buffering.The LnxVoice SDK directly interfaces with your system’s ALSA driver and network sockets, taking the difficult part out of VoIP implementations. LnxVoice VoIP Engine SDK(includes an evaluation version of the VoIP library, header file and docs). Demo runs on TI Sitara platform. iPVoice sample program demonstrates the use of Adaptive Digital’s VoIP Engine software in a mobile handset environment. In particular, the VoIP program, iVoIP Engine turns an iPhone (or iPod or iPad) into a limited capability IP phone. The limitation is that the program communicates via RTP using user specified IP address/port number.